Can’t get enough of forex volatility this week? Let’s check out the TWO monetary policy announcements scheduled this week and see if you can get pips from the events! 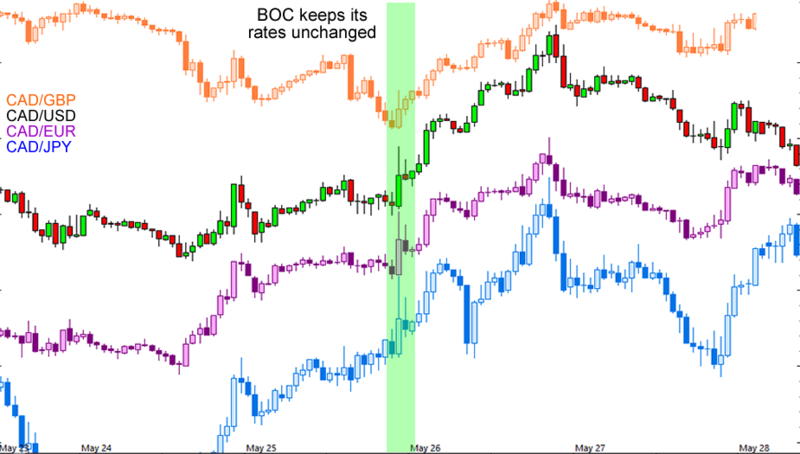 The last time the BOC made a policy decision was in late May. Back then the central bank’s slight optimism over Canada’s growth, worries over the housing market, and overall neutral tone hinted that the BOC is in no hurry to cut its interest rates. Since then Britain has voted to move out of the EU, confidence in the global economic recovery has been shaken again, and oil prices have returned to their two-month lows. More importantly, Canada’s economic reports have printed spotty results at best. The latest employment numbers, for example, showed that full-time hiring has slumped and that the participation rate has fallen for the third month in a row. So with no relief in sight for Canada’s exports and the labor market on shaky ground, will the BOC finally pull the trigger and announce a rate cut? Not necessarily. Tomorrow at 3:00 pm GMT BOC Governor Stephen Poloz and his gang are still widely expected to keep their interest rates steady at 0.50%. Apparently, analysts are banking on the central bank waiting to see how the other central banks react to the Brexit fallout before making their own moves. That doesn’t mean the BOC can’t change its mind though! Keep close tabs on the release to see just how much the latest developments have changed the BOC’s neutral stance! Put on your seatbelts and get ready for a wild ride! On Thursday at 12:00 pm GMT the BOE is releasing its first monetary policy decision since Britain has voted to leave the EU. In its last statement the BOE was at the edge of its seat ahead of the EU referendum. Back then Governor Mark Carney and his team warned that a Brexit remains the biggest risk to the U.K. economy. They said that a vote to leave would challenge the central bank’s ability keep inflation stable while it tries to boost output and employment. Fast forward to two weeks after Britain has actually voted to LEAVE the EU and we see the pound about 12% lower against the dollar, yields on the U.K.’s 10-year gilts down to its record lows, three of the U.K.’s biggest property funds refusing to let investors withdraw their money, and credit agencies lowering their growth forecasts for the U.K. The BOE didn’t wait around before firing its first bullets though. Immediately after the Brexit vote, Carney held a presser stating that the BOE has “taken all the necessary steps to prepare” for a Brexit. He also declared that the central bank “will assess economic conditions and consider any additional policy responses.” Then, just last week the BOE’s Financial Policy Committee (FPC) reduced its “countercyclical buffer rate” from 0.50% to 0.0% until June 2017 and effectively unlocked around 150B GBP worth of lending capacity for the U.K.’s banks. On Thursday the BOE is widely expected to cut its interest rates by 25 basis points to a new record low of 0.25%, the first reduction since March 2009. A less popular prediction calls the central bank reviving its asset purchases, an option that has been on hold since November 2012 and has an outstanding balance of 375B GBP. Before you short the pound like there’s no tomorrow though, keep in mind that the BOE doesn’t have enough economic reports to work with just yet. Any move at this point would be pre-emptive and mostly symbolic. A rate cut would set the tone for the BOE’s next moves and could send the pound back on its bearish track. But if the BOE doesn’t make any changes this month, then we could see the pound rocket higher across the board. How about you? Do you think that the BOE will cut its rates this month? Don’t hesitate to share your two cents on the poll below or on the comments section!